You may not know this, but Bottlecap Press has probably already published something by one of your favorite internet writers. And if they haven’t, they will be this year. 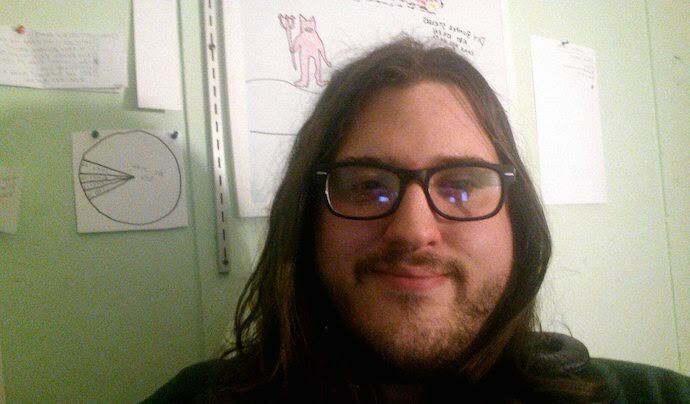 I sat down, keyboard to keyboard, with CA Mullins to find out a little bit more about the up-and-coming small press out of the Midwest that’s been running a tight game since 2015. First of all, tell me a little about the press. Who runs it with you, if anyone? How did Bottlecap get its name? Are you blessed enough to be able to call Bottlecap a day job, or is this something you’re doing purely in your spare time? reminds you you are a criminal. I had a pretty wild time in Alaska that summer, and decided I would come back for summer ’14. The second time around was not so fantastic, and I was conned out of a lot of money by the people who were supposed to be my employers. I was devastated, and I started desperately submitting my writing to publishers in hopes that maybe with a little money on the side, I might not end up homeless, stuck in Alaska. When I was finally offered a book deal, the royalty percentage was pathetic, something like 10%, nothing that could possibly help me out of my situation. I had about $1000 left in my bank account when Bottlecap Press was born. So I purchased a ticket back home to Missouri, and instead of going out and getting a job like any sensible person would do, I spent my last $500 on a printer and paper, and started printing some of my own books. I had no idea what I was doing, but I was selling just enough to keep myself alive, so I forced myself to get better and better, with the goal of eventually developing Bottlecap Press into something that could offer others the fair deal that I couldn’t get. In January 2015, one of my closest friends, Brendan Kolk, joined me in my efforts and helped make Bottlecap Press what it is today. Now, although I do have a part time side job writing subtitles for videos, BCP is a full-time gig. Usually more than a full time gig. It keeps me busy. While some of Bottlecap’s books complement each other—I’ve been suggesting that friends pair Uptalk with & Blue Beds Held, for example—others don’t feel like they’ve been published with the same reader in mind. Do you consciously anticipate or conceive of an audience for Bottlecap as you choose and then print your books? Sometimes yes, sometimes no. We publish books that we like. We do consider whether other people will like it too, but usually, we’re the only ones an author needs to impress. I like to think we can be a home for all sorts of authors, as well as all sorts of readers. We’ve fostered a readership in a few different communities, which helps, though it can sometimes be challenging trying to connect with such a wide variety of readers. Most of our authors bring some number of followers along with them, who often join the collective pool of BCP readers, so I think, or at least I hope, that we’re doing something right there. Because Brendan and I together have such broad tastes, we’ve made it easy to find at least one book for everyone in our catalog, and I like that diversity. Mainstream presses don’t do a very good job as far as variety goes, and so offering a lot of variety is part of my personal backlash against the literary establishment. Who are they to say that just because a book has a small potential audience, it doesn’t deserve to be read? Instead of catering to a single readership and leaving everyone else in the dust, we like to publish a diverse range of books, even if some of them might be esoteric. That said, we love our readers, and if there is any single audience that we cater to the most, it’s those who like to be challenged by a variety of new and unexpected material. How have these manuscripts come to you? We’re always accepting new submissions via email at bottlecappress@gmail.com. I feel like I’ve failed to make this a well known fact, although we rectified that recently by pinning it to the top of our Facebook and Twitter pages. Somehow, even though that information was hard to find for a while, we’ve still gotten new submissions basically every day for the last year. I think writers are generally very determined, and are usually willing to search. I’ve considered the idea of soliciting submissions, as there are a lot of particular authors I’d love to work with, but I feel like that wouldn’t be fair, and it would put the odds against the people who specifically seek us out. It’s my job as an editor to be unbiased, and sometimes that can be a hard job. In terms of book design, I have noticed many Bottlecap books are designed and/or illustrated by different artists. Vanessa Castro’s illustrations and cover are the perfect complement for The Female Gaze Is Cool, while I can imagine no better cover for Kimmy Walters’ Uptalk than the one by Jessica Hayworth. Is design something you and Bottlecap have a hand in, or are your authors more responsible for the look and feel of their books? Brendan does the majority of the layouts in-house, as well as some cover design work for those authors who don’t already have artists in mind (he did the covers for Blueberry Lemonade and Street Monk.) He’s our resident Photoshop/InDesign wiz. The majority of our authors, when the cover conversation came up, already had artists in mind though, which makes our jobs easier. Getting EA Hyde and SJX together was my idea though, and I’ll admit, yes, it did feel like a stroke of genius! SJX’s book, when he submitted it, seemed like it would work best with some wild illustrations, and I happened to notice him and EA commenting on each other’s Facebook statuses, and it just clicked. I’d love to do more books with illustrations, but they can be hard to organize on our end. I wish more projects came to us with illustrators built-in. I’ve wanted to do a comic book for ages, but that’s a harder scene to break into. The binding, too, feels unique to the title—and from what I’ve heard, is all done in-house. What has this process been like? And how in the world are you keeping up with demand for perfect binding every copy of Uptalk that gets made? The biggest thing I’ve learned from binding books is that you never stop learning how to bind books. Most of the time, it feels like there’s more art to it than science, and getting that art right is one of the biggest obstacles for every project. The type of paper, the type of glue, the intended look and feel of the book, how many pages, whether it’s small enough to staple, and whether that means that it really *should* be stapled…there are a lot of factors that go into it. The perfect binding was all done by hand with a paintbrush until just a few months ago when we finally saved up for a desktop perfect binding machine. Even with the machine, it’s still an art, and it’s still complicated, really the only difference is that our books are generally sturdier now, and instead of taking three hours per book, making ten books at a time, it takes five minutes per book, one book at a time. It’s made things a lot more efficient. Keeping up with the initial demand for Uptalk did, in fact, bury us both under a mountain of scrap paper. At the time, I liked to joke that my office looked like Dunder Mifflin got hit by a tornado. And that was when everything was done with a paintbrush. We’ve learned to create books out of habit now though, and we absolutely did learn that the hard way. These days, it’s more like, “Oh, it’s Monday? Let’s make ten of everything just in case,” or “Oh, the sky is blue, looks like we’ll need some Uptalks.” We’ve gotten better at predicting waves of sales. I love that you have an option to buy imperfect books at half price on your website, and that now you’ve opened up a subscription service for ebooks. How did you decide to release Mallory Smart’s I’m AntiSocial, Coffee Never Lies in two parts? Mallory’s book was divided into two parts mainly as a cost-saving technique, and it worked naturally because her book was already divided into sections. In order to stay alive *and* give authors the 50% they deserve, it’s crucial to keep costs as low as possible. We’re very thrifty, and we like to spend every penny wisely, because one of the realities of small press publishing, almost by definition, is that it’s an industry on a budget. You have to be creative to make a career out of it. My side job has been responsible for many of our equipment purchases and upgrades, and although Bottlecap Press makes enough profit to sustain itself, it doesn’t make enough to continue growing at the rate it grew in 2015. That’s why we’ve decided to give crowdfunding a chance. We want to create a bigger, better Bottlecap Press for the future, and we’ve got a lot of innovative ideas for how to do that, but a lot of those ideas require startup costs, and with Brendan and I having already emptied our pockets for this company over and over, there’s a cap to how fast we can grow on pocket change and moonlighting. What’s next for Bottlecap? Any new innovations on the horizon? Eventually, we aim to bring the Bottlecap philosophy to all sorts of different creative media, and I dream of one day being able to blend media, and bring communities together all across the artistic spectrum. Imagine that one day, a book could be paired with a soundtrack by the perfect band, or could be adapted into a film, or a cartoon, cheaply, perfectly and effectively. Literature is an art, and only now, because of our digital world, are we able to scratch the surface on blending it with multimedia into one all-encompassing experience. That’s my vision for the future of Bottlecap Press, and I think we’ll get there, one step at a time.